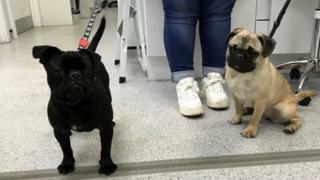 People struggling to cope with their animals have been urged to seek help after two pugs were tossed from a car while at traffic lights. The RSPCA said the dogs' experience in Wrexham would have been "scary and traumatic". It said they were among 145 pets abandoned after Christmas, 92 of them dogs. The charity said animal abandonment was a problem and urged people to hand over unwanted pets to rescue centres. There are a number of reasons for people abandoning animals - with reasons including people growing bored of Christmas presents or dumping them in the summer rather than find care when they go on holiday. RSPCA Cymru superintendent Martyn Hubbard said: "Tragically, many are carelessly abandoned, while others are advertised online and on social media with owners offering them 'free to a good home' or trying to cash in on their pet's worth. "When owners are unable to cope, whether that be with an animal's behaviour, the costs of keeping the pet or other things in their life take over, they opt to dump them." Inspector Rachael Davies said the pugs were now recovering after they were dumped on 20 February and one of them had been traced to owners in Essex. "Put simply, this is a disgusting way to treat animals." RSPCA figures show month-on-month calls about abandonments remaining consistent. In the past two years, there were increases in the numbers of dogs abandoned in January compared to December: from 91 to 112 in 2016/2017; 112 to 113 in 2017 to 2018; and 83 to 92 in 2018/2019. In January, RSPCA Cymru received the most calls (13) about dog abandonments in Cardiff, while there were nine in Torfaen and none in Vale of Glamorgan. All local authorities provide a dog warden service and it is their responsibility to round up stray dogs. RSPCA Cymru said it did not have the resources to pick up all healthy ones, but urged anyone finding a sick or injured stray to contact them. The spokeswoman said by law all dogs should be micro-chipped and have a collar with the owner's contact details, meaning it could then potentially reunite them. There were 129 calls to RSPCA Cymru about all animal abandonments in December this year and 145 in January.